The first stop of my day trip to Florence was the Basilica di San Lorenzo. 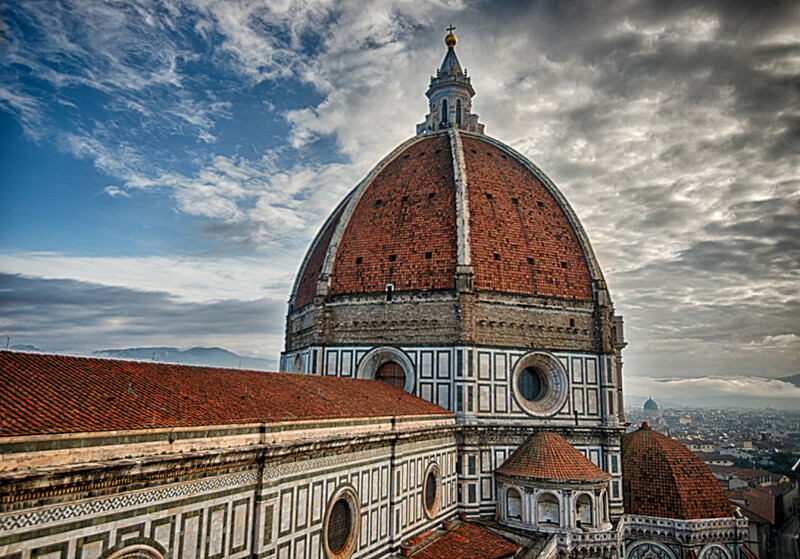 Another of the works of the great Renaissance architect and engineer, Filippo Brunelleschi, construction of the basilica started in 1419 but was not completed until 1459, thirteen years after Brunelleschi’s death. Although not originally commissioned by the Medici, the wealthy political, banking and, later, royal family of Tuscany, the Medici stepped in to finance San Lorenzo in 1442, when construction faltered due to lack of funding. 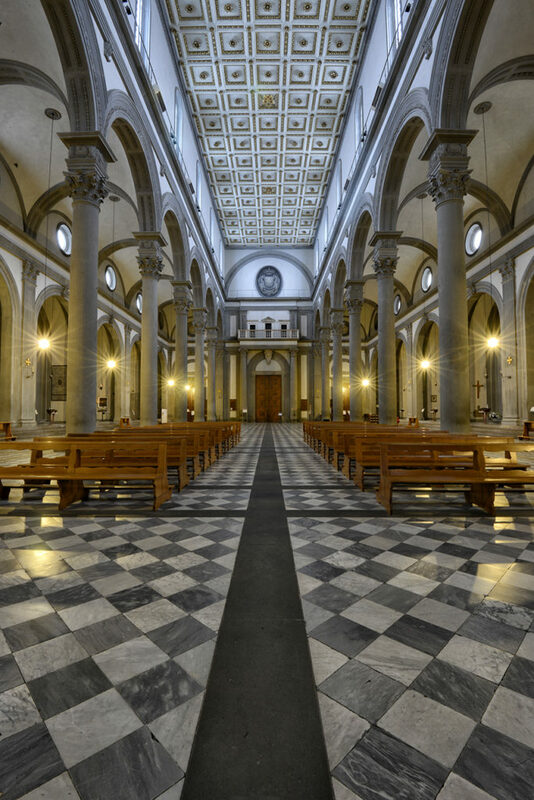 Thereafter, San Lorenzo became, de facto, the church of the Medici family and is the burial place of all of its principal members who died from the 1460s until the 1720s. Standing in a nearly deserted six-hundred-year-old church early on a cold, winter morning was a nerve-tingling experience: I felt not only the weight Brunelleschi’s imposing dome, high overhead, but also the weight of history pressing down on me as I stood there. When I entered the basilica, at 7.45am, there were just two worshippers inside, both young men; each kneeling in silent prayer at a separate side altar. Although almost deserted, the centre of the church was cordoned off by waist-high wooden barriers. I had observed the same restrictions in other Italian churches, making them difficult to access. And, of course, there were the ubiquitous “No Photography” signs. As there was almost no-one around, I eased one of the barriers aside and slipped out into the centre of the marble floor, the vantage point that I knew I would have to attain to get the shot I wanted: straight down the aisle towards the massive wooden doors at the back of the church. No sooner had I erected my tripod, set my camera to auto-bracket five exposures and hit the button than, with depressing predictability, an elderly gentleman emerged from the deep shadows at the side of the church and came scurrying towards me. Introducing himself as the sacristan of the basilica, he left me in no doubt, in voluble Italian, that the spot where I was standing was off-limits and that he did not appreciate my illicitly photographing his beautiful church. But he was a kind enough man, just doing his job. Seeing the obvious disappointment in my face, he had the decency to indicate, with a wave of his hand, that he would allow me to complete the one photograph that I had already begun. It is the lead image. Once ejected from the great church, I was escorted by the sacristan to the cloistered courtyard, which provided ample consolation for my earlier disappointment. Built in a square, with a cloistered walkway running around its perimeter, the centerpiece of the courtyard was an elegant tree. Narrow gravel pathways, lined by low box hedges, radiated out towards the four corners of the square. 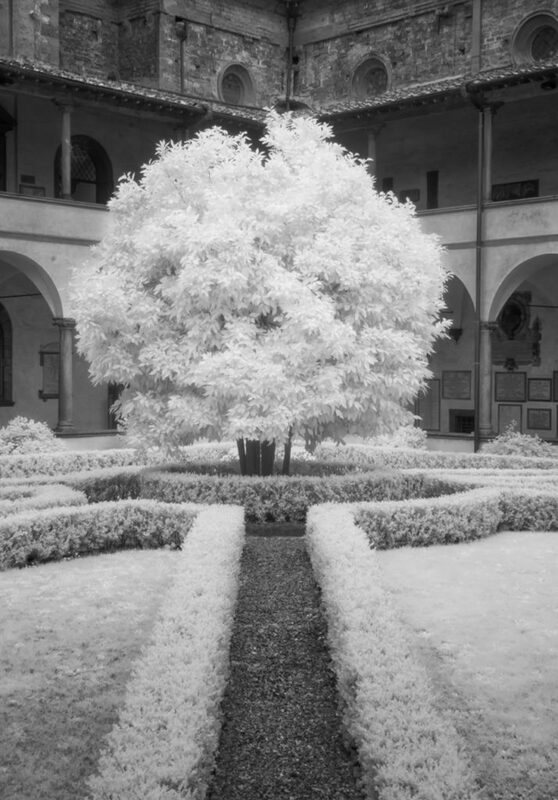 In spite of the muted, early-morning winter light, I photographed the tree, framed by the ancient walls of the basilica, in infrared. Sometimes, getting kicked out of a church isn’t such a bad thing after all. So said the travel agent, when I phoned to inquire about possible ways to get from Milan, in Italy’s industrial north, to the capital, some 360 miles to the south-west. Having been asked to speak at a conference in Milan on a Wednesday and at a second event in Rome on a Friday, the conference organizers left me to my own devices on the Thursday, simply asking me to make my own way from Milan to Rome that day. “You could fly”, they suggested, unhelpfully. But once I heard that the Milan to Rome train stops in Florence and that I might have the opportunity to spend a few hours there, all thoughts of flying were immediately discounted. Faced with the prospect of, at most, six or seven hours in Florence, a city I had never before visited but had long wanted to see, my principal concern was wasting time and missing the best shooting locations. 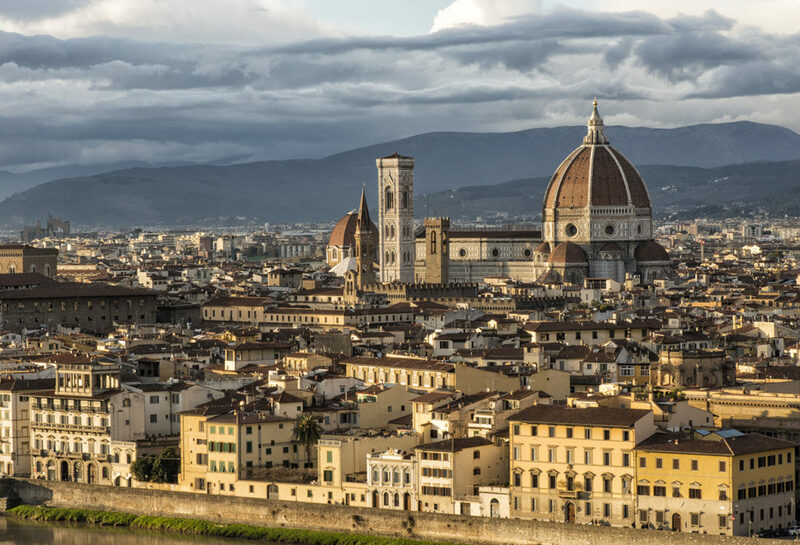 A little research ahead of my trip led me to a Florence-based professional photographer, Giorgio Magini, whom I hired to devise an itinerary for me, starting and ending at the railway station. This idea turned out to be the best thing I could have done to make my short time in this beautiful city as productive as possible. Giorgio figured out a path through the city which took me to all the best locations and gave it to me as an interactive Google map, accessible from my iPhone, with specific instructions on where to go and, even, what to look out for at each location. Giotto’s magnificent campanile, all 280 feet of it, proved to be a vigorous but worthwhile climb, providing inspirational views not just over the dome and the piazza below but over the entire city. Originally a celebrated painter, Giotto di Bondone was nominated in 1334 as successor to the original Master of Works of the Cathedral, Arnolfo di Cambio, some thirty years after the latter’s death. Working closely with Filippo Brunelleschi, one of the preeminent architects and engineers of his day and designer of the cathedral’s magnificent dome, Giotto and Brunelleschi together made some of the most seminal contributions to the founding of the Italian Renaissance. Begun in 1334, only the lower floor of Giotto’s bell tower had been completed by the time of his death in 1337; it was eventually completed by another of the greats of the Renaissance, Andrea Pisano, in 1359. 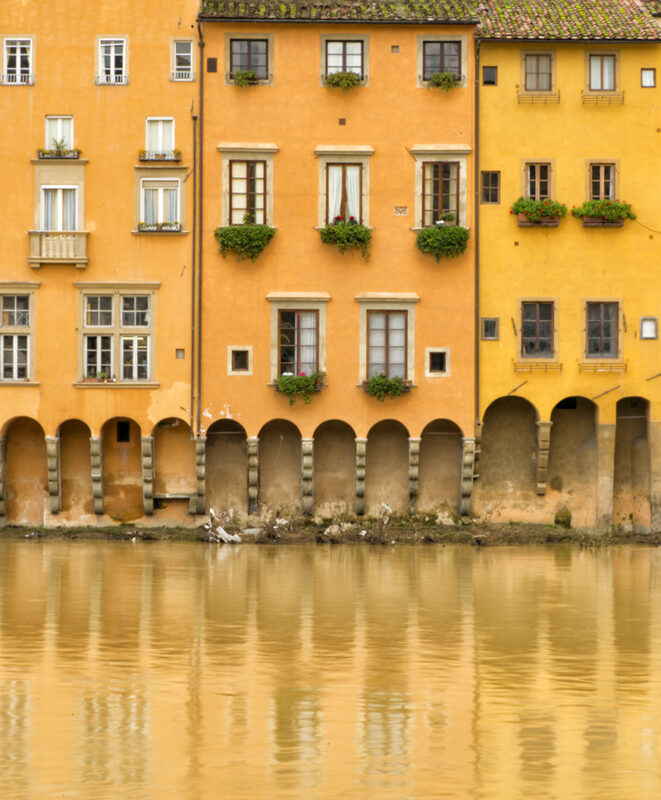 Of course, being an undisciplined and inquisitive soul by nature, I frequently veered off my pre-ordained trail, wandering off into interesting-looking alleyways and poking my nose inside various courtyards and houses, finding my own locations and compositions, such as these colorful houses reflected in the waters of the Arno River, just east of the Ponte Del Vecchio. By 5.00pm, the wisdom of Giorgio’s map had directed me on a long walk out towards the south-east of the city and up another steep climb to the Piazzale Michelangelo, an elevated square affording commanding views of the river and the city to the north-west. By 5.30pm, the light of the setting sun began to turn from white to yellow and, eventually, to gold, bathing Giotto’s campanile, Brunelleschi’s dome and the yellow houses along the banks of the Arno in sweet light, as in the lead image. Thank you, Giorgio. Another lengthy walk had me back at the Stazione Santa Maria Novella by 6.30pm, in good time to catch the 7.05pm “FrecciaRossa” (Red Arrow) high-speed train to Rome. 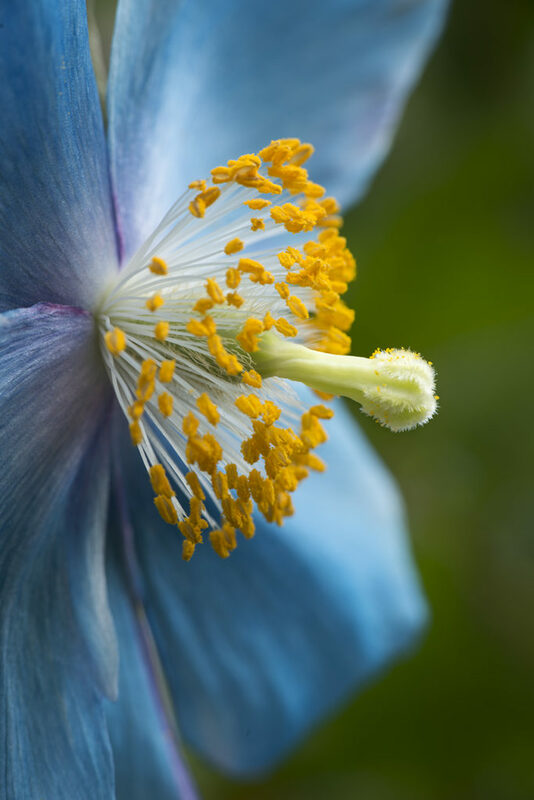 Silly season for Washington-area flower photographers officially kicked off today with a mad dash to Longwood Gardens in Kennett Square, PA to photograph its much-anticipated blue poppies. Perhaps it was the fact that we had all been cooped up too long over this cold, hard, seemingly interminable winter or that few of us had seen a flower anywhere outside of a grocery store in more than six months, but the throng of photographers that descended on Longwood this morning was beyond crazy. That said, I do not regret that I was one of them. Like a drug addict who had been denied his fix for too long, the second I knelt down before those exquisite, exotic beauties, I once again felt that familiar, sugar-sweet rush of horticultural happiness blitz through my photographer’s veins like crack cocaine. 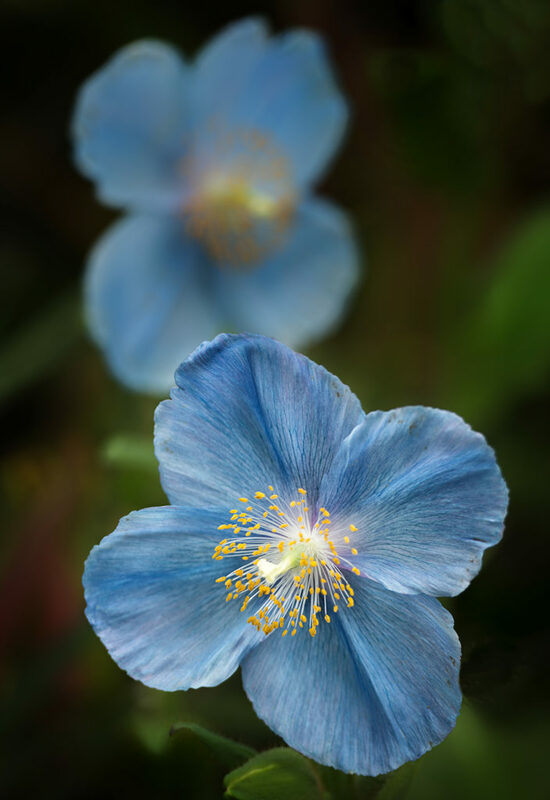 The blue poppy (Meconopsis Grandis) is native to the high elevations of the Himalayan Mountains and is the national symbol of the Kingdom of Bhutan. Its very existence was long disputed, in the same way as was that of the Yeti, another mythical Himalayan native. In the early twentieth century, sightings were reported and quickly denounced. 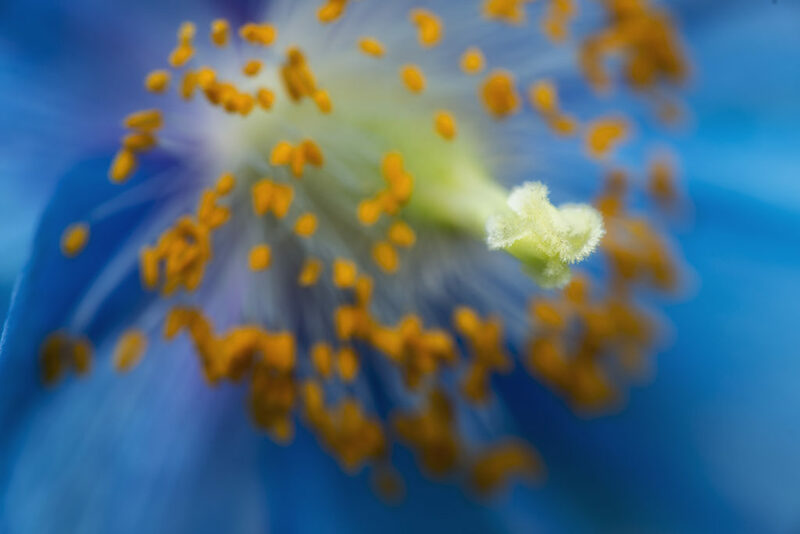 A blue poppy? Who had ever heard of such a thing? Poppies are always red, surely. But, in the late spring of 1922, a British Himalayan expedition, led by legendary mountaineer George Mallory, discovered the plant on their failed attempt to reach the summit of the as yet unconquered Mount Everest. As a result, the mythical flower was finally introduced to the outside world amid great excitement at London’s Royal Horticultural Society show in 1926. Thus has grown the legend of the blue poppy. Little wonder, then, that some of us are willing to drive hundreds of miles to photograph this fabled flower. To photograph these delicate beauties in the mid-Atlantic region of the United States is an unmissable opportunity. Longwood Gardens force their blue poppies to flower every year in March and they last for only two weeks. The poppies themselves are large flowers, about four inches in diameter, with languid, generous petals of a deep, mesmerizing sky blue colour. 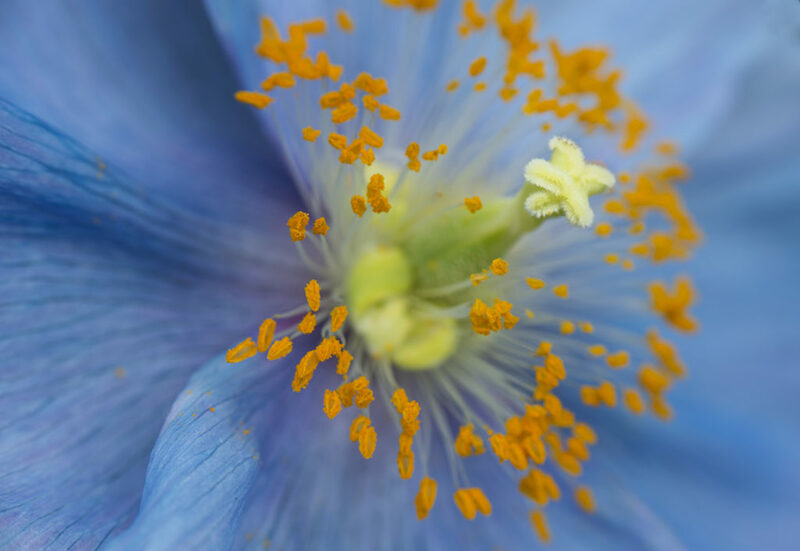 The combination of cool (blue) and warm (orange) colours in a single flower makes the blue poppy an obvious favourite with photographers, who will go to extraordinary lengths to find such a fortuitous combination of colours. I’m glad I did so this morning. Ask any visitor to Washington, D. C. to name the city’s most famous war memorial and she will probably say the Vietnam War Memorial or, perhaps, the newer, much grander World War II memorial. It’s almost certain she will not mention the Korean War Veterans Memorial. Yet, to my mind, the Korean War Memorial is far more moving than either of its more illustrious neighbours. The Korean War Memorial is so often overlooked that I wonder if it has to do with the fact that the Korean War itself has been forgotten. A conflict that happened some time vaguely between World War II and Vietnam for reasons that no-one remembers and with an outcome that no-one can recall. It’s America’s forgotten twentieth-century war. Yet, almost 40,000 Americans died in Korea in three years, compared to 58,000 in ten years in Vietnam. 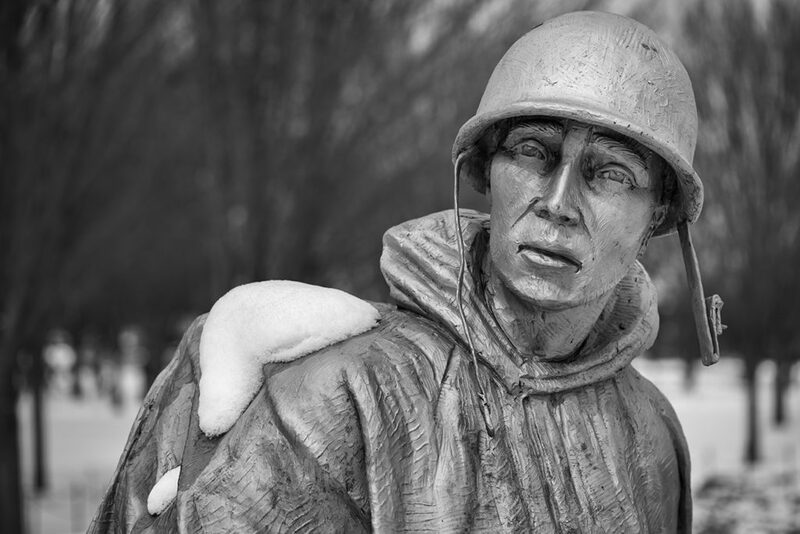 Korea was a short, costly, brutal war and one that was hellishly difficult to fight, especially in winter, when many American soldiers suffered frostbite from patrolling and fighting in knee-high snow and sub-zero temperatures. 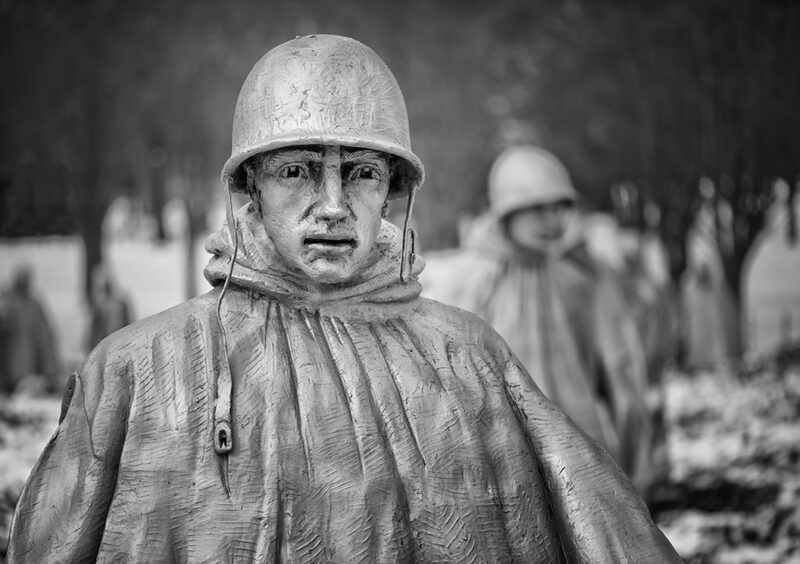 The monument that commemorates the Korean War is marvelously effective in showing the horrors that American troops went through fighting in Korea. The memorial comprises nineteen, stainless steel, larger-than-life sculptures of patrolling servicemen, designed by Frank Gaylord. 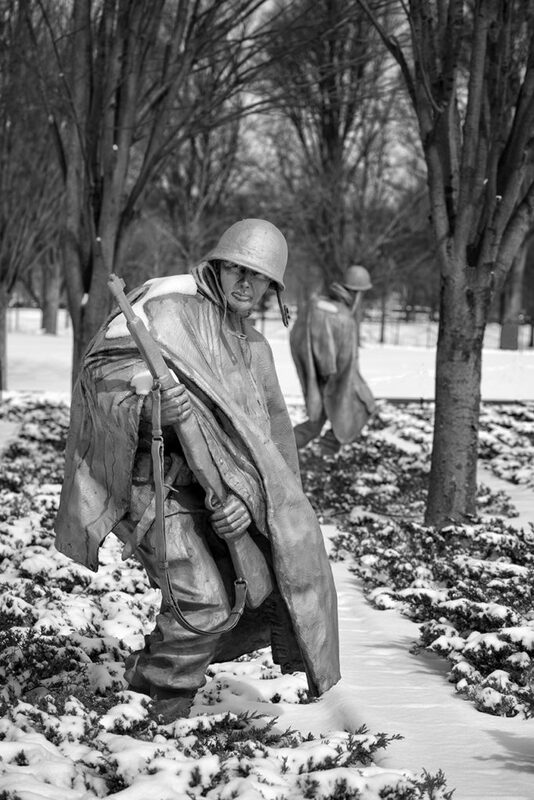 The sculptor’s achievement, in showing the fear, the weariness, the terror in the soldiers’ faces, is truly remarkable. Adjacent to the soldiers, a highly polished granite wall reflects the sculptures, making it seem that there are thirty-eight, thereby evoking the 38th parallel, along which the war was fought and which divides the two Koreas to this day. 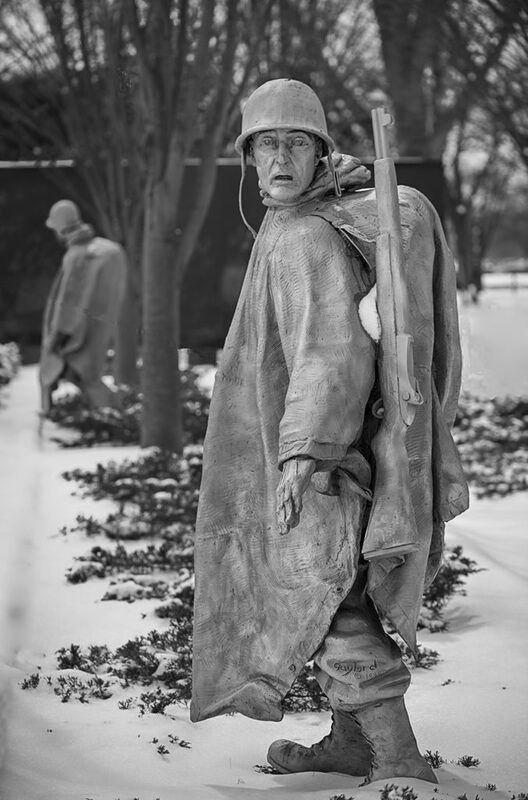 Although I have photographed the memorial before, I have wanted for some time to photograph it under the cover of snow, to try to evoke the hardship endured by the troops fighting the war in winter. I finally got my chance during the recent record snowfall in Washington. The memorial is always haunting but, when covered in snow, it looks even more poignant. 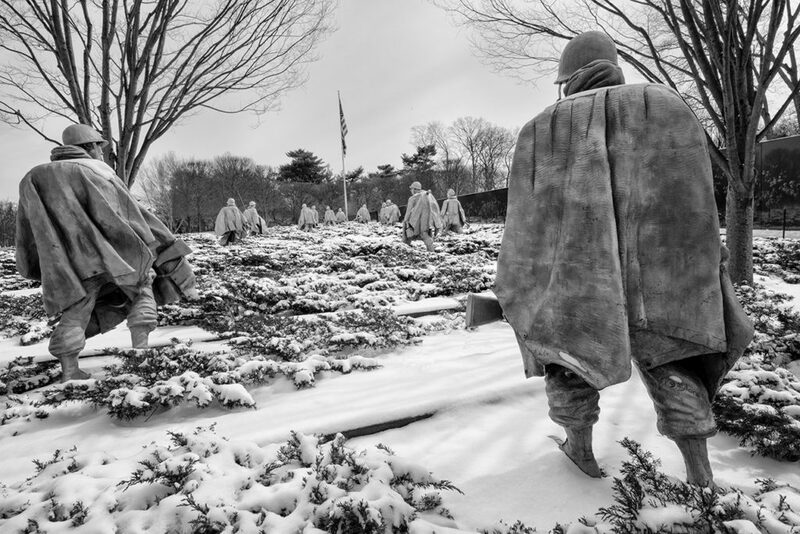 The Korean War Memorial offers a great lesson in the value of the 360o approach to photographic shooting, by which I mean walking around the subject and viewing it from all angles before starting to photograph. Most people do the obvious thing, walk up to the front of the memorial and photograph it standing before the front solider. That’s a perfectly valid way to shoot the memorial and can produce good images. But I have found that, walking round to the back of the memorial produces a much more interesting composition, as seen in the lead image. By shooting from this position, the photographer can create for the viewer the illusion of being part of the patrol, of holding up the rear, of protecting the back of the last soldier from sniper fire. Plus, all the servicemen are seen as marching towards the American flag. Once I had taken this shot, I concentrated on photographing some of the individual soldiers, using a very shallow depth of field – f2.8 or f4, depending on the lens I was using – to isolate the main subject and to frame the composition so as to include a blurred second soldier in the background, thus retaining the feel of the patrol. This required patience as, even on a snowy, bitterly cold morning, there were a lot of tourists milling around and I had to wait several minutes before taking some of these images, in order to ensure the background was clear of people and maintain the illusion of a winter foot patrol in Korea in 1950. Perhaps the most memorable aspect of my visit was that I got talking to a middle-aged man from Texas, whose father had fought in the Korean War. He followed me around for about half an hour and was quite frank with me that he could see I was finding some good compositions, so he just stood next to me and took the same photographs! I didn’t mind at all. He told me that his Dad seldom talked about the war but the only story he did pass on to his son was that the winters were so cold that, when his colleagues were killed in combat, their bodies froze so stiff that they used to stack them one on top of the other, like pieces of firewood. Such a poignant story. As if the Korean War Memorial weren’t poignant enough.